Fast forward to now. Last Sunday (July 14, 2013), on a night-before whim, I decided to go Gothic Basin with my friend and first gym climbing partner, Joseph. I’d been to Gothic Basin before, but didn’t make it up to Foggy Lake, and I wanted to see the lake and maybe maybe scramble Del Campo. We rolled out of Lake City around 9am and got to the trailhead at 10:30. About halfway up the trail, we encountered this guy hiking by himself, a bit younger than us, muscular, also Asian-American. He was hiking at the same pace as us, so we ended up hiking together. The snow started around 4000 feet or so, and the basin itself was entirely snow-covered. It was 1:30 by then, plenty of time to scramble Del Campo, which I read was a pretty easy peak. I took out my ice axe which I had brought in case there was steep snow, and I gave Joseph my ski poles to use. I told the dude that Joseph and I were going to try to climb Del Campo, or at least get as far as we could. Now this guy was completely unprepared even for the Gothic Basin hike, a hike that’s one of the most rugged normal non-climbers’ trails in Washington. He was wearing black running shoes which were already soaked through by the time we got to the basin. The route from the basin to Foggy Lake and the base of Del Campo isn’t very steep, so the dude followed us. Well, the base of Del Campo got to be halfway up Del Campo. 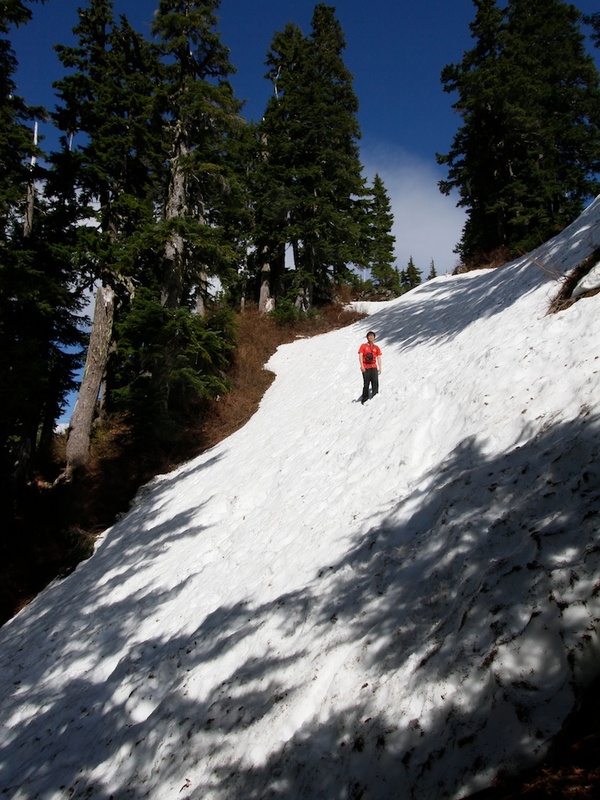 We found ourselves climbing steep snow, and we were too far into it for Dude to turn back. Dude was having trouble with his footing, he felt he was in a dangerous situation, but he clearly wanted to continue, and I wasn’t about to call it on account of somebody who just happened to be following us. He was in a weird gray area–maybe he was more than some dude who was following us–we had hiked up half the trail and had lunch together. I felt some responsibility for him, kicked myself for not telling him earlier to go home, told Joseph to give him one of the ski poles, and showed them how they could use the pole with the basket removed to self-belay. Dude climbed (maybe crawled is a better word?) 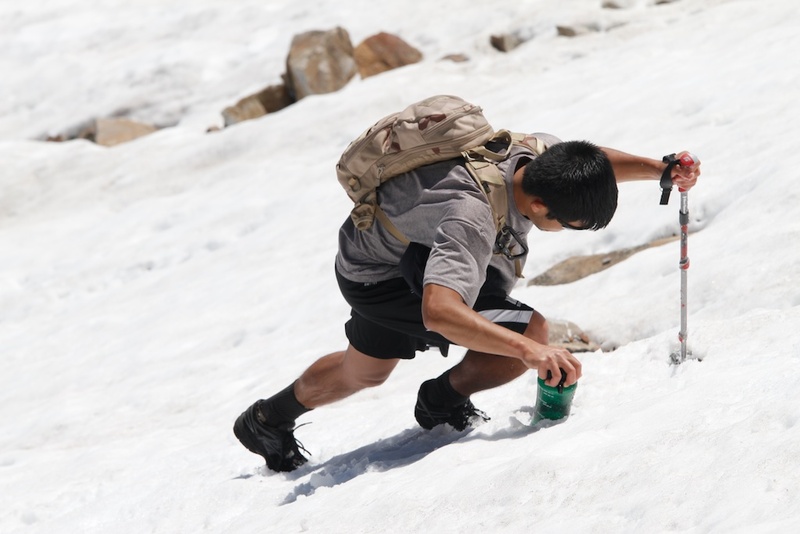 with the pole in one hand and his Nalgene in the other, which he used both to make steps for his feet and to prevent ungloved hand from touching the snow and getting too cold. With great difficulty, we eventually got off the snow onto rock, and did the 4th class scramble to the summit. It was even harder going down. We glissaded some portions, but had to downclimb others, and Dude was having trouble even standing up. He slipped a few times and managed to stop in the soft snow. Long story short–it was sketchy, but we all lived, and to my question, “Maybe you should consider taking a mountaineering class,” he responded in the affirmative. So I hope I’ve made another future climber, as Ice Axe Man made me three years ago. The summit! Click to see photo album. 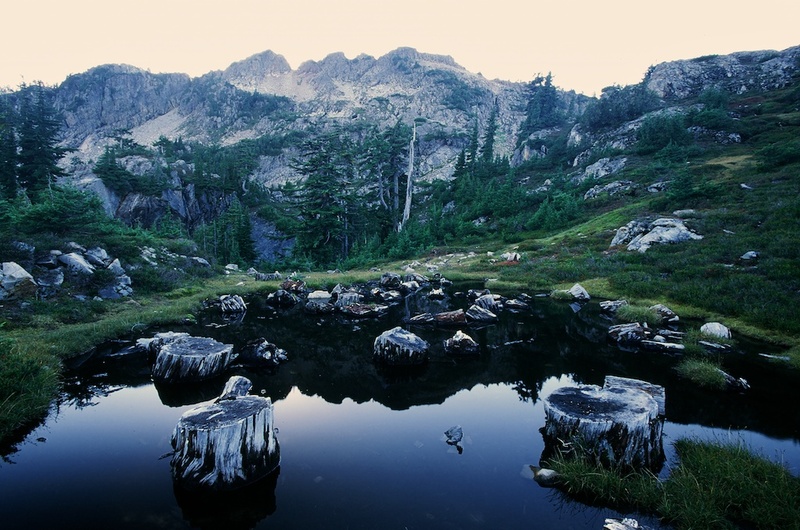 PS: Turns out Gothic Basin is more scenic when the snow melts, what a difference a month makes. This entry was posted in Hike, Scramble by mastica. Bookmark the permalink.